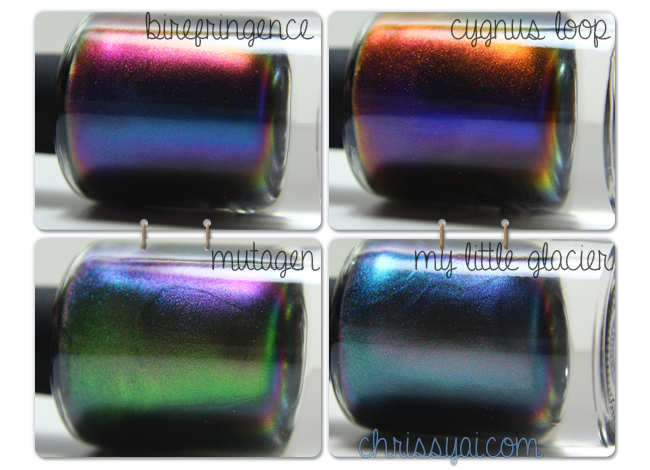 ChrissyAi: I Love Nail Polish Ultra Chromes Giveaway! 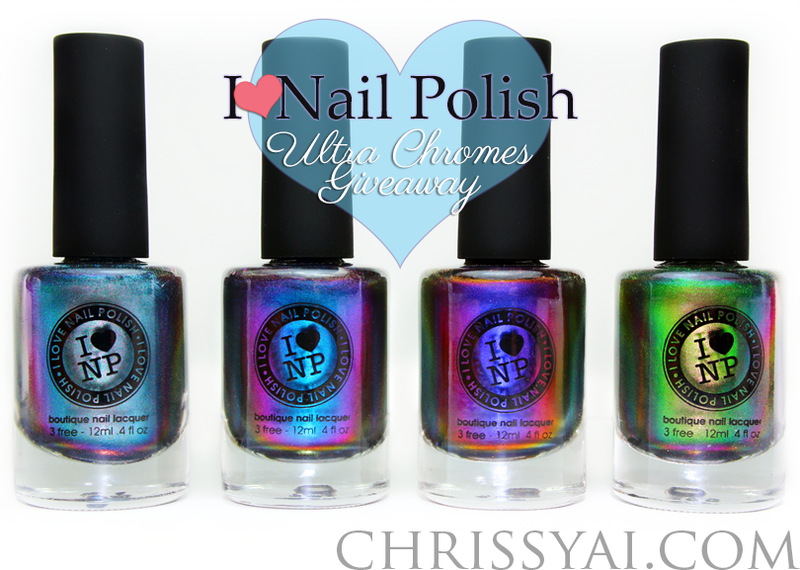 I Love Nail Polish Ultra Chromes Giveaway! I Love Nail Polish has once again been so generous to sponsor prizes for a giveaway. The difference this time.. the ever so desired Ultra Chromes! AHHH! These chromes are absolutely true to bottle color, there is NO catch here. I honestly thought that when I saw these in person they wouldn't be anything close to how amazing they look in the bottle shots.. but they are. • Must be publicly following me via GFC. • Must 'Like' my Facebook Page. If you do not have a Facebook, put in the form "No Facebook" to unlock the other options. This entry will not count. Meaning if you are chosen for the Facebook entry, I will choose another person. However, if any other entry of yours is chosen, this entry will not disqualify you as it would if you submitted the entry with your name but did not Like the page. • Must be 18+ OR have parental / legal guardian(s) permission to give out your address. • Any incomplete and/or invalid entries will disqualify you. • If I do not receive a reply within 48 hours of sending the email, another winner will be chosen. • Once the prize is mailed out, I am no longer responsible for the items or any damages that may occur during transit. -Please allow 2-4 weeks for the prizes to be mailed out as I will be mailing them out myself. • This giveaway begins September 7th, 2013 and ends on September 28th, 2013. Your swatches are always ah-mazing! Awesome giveaway! My favorite brand hands down is Zoya! Zoya is quickly becoming my favorite non-indie polish! My favourite nail polish brand has to be China Glaze, I have waaaay more of them than any other brand lol. I've been really impressed by Color Club & Sinful Colors lately too. I think I like Essie, it's really easy to apply, the size is right and the colors are current. Thanks! Thanks so much for this giveaway! I've been quietly lusting after ILNP polishes for ages. My favourite polish brand is probably OPI, but I love A England as well. I like Butter London and Revlon! Never found one that doesn't chip yet! My favorite brand is color club!! Oooohh, good question! Formula wise I love OPI but China Glaze is my go to for fun colors! My favorite brand of polish is Zoya! Thanks for the giveaway! I am such a sucker for China Glaze! But then, I have a hard time resisting any brand. I fell in love with MISA a few years back. I am biased with the brand and the cute square bottles! I really love Essie! The colors are so nice and the bottles are really cute! My favourite brand for today would be Golden Rose (it's turkish, but very popular in Poland). My favorite is Above the Curve. $1 from every bottle sold goes to Shriners Hospitals for Children. I really love butter LONDON polish,and am thankful it's in the US too. I love me some Zoya! Out of our local polishes I prefer Don Juan polishes and of all the polishes available in my country my favourites are Zoya polishes. Elle 18 is my favorite brand of nail polish. Non indie would be Sinful Colors, Zoya, WnW, LA Girl, LA Color, Sally Hansen, Rimmel, Maybelline....etc. I have alot of favorites! My favorite brand of nail polish is El Corazon. Sally Hansen! Thank you for the chance! I am Canadian, but don't own any specifically Canadian Brands that I'm aware of. My favourites are A England and Colour Club. Tip Top is my favourite local brand! Hi! I´ve just discovered your blog and I love it. I live in Spain and I love the brand Kiko, though it´s an italian brand. I wish I could win these amazing polish!! Seventeen nail polishes are my favorite Greek polishes!!! Hi, thank you for this awesome giveaway! My favourite brand in Argentina is Thelma & Louise and Sally Hansen. Those brands are great!! I like Essence and Kiko. In belgium we have essence, it's quite cheap and it has a lot of pretty colors. I don't really know if it's good because i'm the kind of girl that changes a lot of nail polish because i really like some chance, so i don't know if it would stay on for long but i really like essence. At least your narrowing it down! :) I guess I would have to say China Glaze since that's the one I own the most of...BUT....I not so secretly love them all! I really really love the nail polish f this Giveaway!! Thanks so much for this giveaway! I'm not sure I can pick a favorite brand! There are too many awesome ones to choose from...ILNP included! That's a tough one. Mainstream, I'd have to go with OPI and ZOYA. Indies would be Different Dimension and Pretty and Polished. I own more Zoyas than any other brand, but I am really digging Colors by Llarowe at the moment! My favorite brand at the moment would have to be Color Club! My favorite portuguese brand is Andreia polishes! Love Lyndarella Polishes! Thank you for the giveaway! I've fallen in love with Julep! My favourite brand is Opi! We don't have much brands sold in my country but I love nail polishes from Avon. Kiko Make up milano, good quality, lots of colors with a great price! Custom made Indie Canadian Nail Polish. All of my nail polish is made in Canada and is one of a kind, kickass, and cruelty free. Be the Black Sheep! I love many brands, among the most expensive I really like OPI and some lines of L'OREAL are very good too. Onorable mention for ESSIE and CHINA GLAZE!! Flormar - long lasting polishes, pretty good shades, and they are pretty cheap. I also love Zoya, China Glaze, Color Club, Essie, Julep and many more, but they are more expensive. I'm from Sweden and we don't have that many brands, but my favorite is Depend because they have so many colors and the price is fairly low. I have many but I think my most favorite would have to be OPI. Thank you for the giveaway! My favorite brands are Zoya, Bondi New York, and Colors by Llarowe(indie). My favorite is Sinful colors and china glaze... Thanks for the giveaway!! My favorite nail polish brand is Zoya! Thank you so much for the giveaway! I love Zoya and China Glaze. Thanks so much for the chance to win! Of the brands sold here, my favourite is Mi-Ny. Thank you for having this giveaway! Being from the US, I have access to so many fab brands...but I do love OPI, Orly, and Sally Hansen, among many others, of course! My favourite nail polish brand is China Glaze. I would like to win for my sister. Oops - I forgot to mention - Catrice would be my favourite locally-sourced polish brand. My favourite polish brand is Catrice! Zoya. Thank you for the giveaway! In my country, I think it's Farmec, a local romanian brand :) thank you fot lovely giveaway! My favourite brand is Kiko. I would have to say Zoya is my favorite. My fav brand is Zoya! Hey who won the contest?